We live in a period of inflation, but do you have an inflation investment strategy to take advantage of it? After defining inflation, we’ll discuss the best investment strategy to take advantage of current conditions and the dangers that may lie ahead. Flexibility is key in what are rapidly changing conditions. The first thing to get straight is that the CPI does not measure inflation. What the CPI measures is the price change across a basket of goods that is constantly changing. When living standards are improving, the quality of goods within the basket is improving and when living standards are declining, the quality of goods within the basket is declining. Consequently, there is no fixed base within the CPI basket to measure price changes. An alternative to the CPI is simply to measure inflation through changes in commodity prices. I particularly like gold as it has been used as money and a store of value for centuries. Inflation results from the quantity of money growing at a greater rate than the economy. It could be that the economy is growing, but the money supply is growing at a greater rate: or it could be that the economy is declining at a greater rate than the money supply. What appears to have happened over the last decade is that the economy has declined, but the authorities have not allowed the money supply to decline in situ. Every now and then, the money supply threatens to collapse, but the authorities are always quick to take action. In such a scenario, assets levered to growth like equities are poor investments. You are better off investing in GOODS RATHER THAN ASSETS, because the value of goods is going up relative to the money supply. 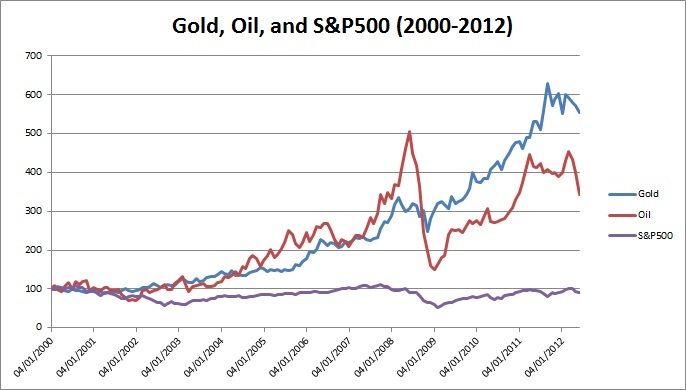 This trend is very adequately shown in the chart below, plotting gold and oil prices versus the S&P 500. How long will inflation last? You have to ask yourself how long this current spell of inflation will last, as you don’t want to be caught holding the can when the cycle turns. The market has threatened deflation a few times recently. During those periods, money has quickly flown back into cash and the treasury securities of some nations, while the price of commodities has plummeted and even gold has come under pressure. Although governments have previously always stepped in to ensure that contraction in the money supply does not take place. They may be forced to allow nature to take its course in the future, perhaps because their own finances have come under pressure or the CPI is at elevated levels. This is a risk that you need to be aware of. In this current environment of inflation created by tepid monetary growth in the face of a declining economy, the best inflation investment strategy continues to be COMMODITIES AND GOLD. They outstrip equity markets of all flavour with stunning performance. The danger for an inflation investment strategy comes when the public get sick of inflation and governments finally take action as they did in the early 1980’s. In that sort of environment, a period of controlled deflation may well ensure for a year or two.